On a small plot of land tucked away on a rarely traveled rural road near Oregon’s Willamette River, a yard sign promotes a once-a-year visitors weekend, the only outward indicator that something special is happening here. 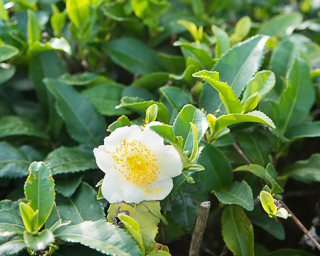 Beyond the sign and a short gravel driveway is Minto Island Tea Company, a nearly half acre plot of land containing Camellia sinensis bushes. More botanic laboratory than tea farm, it’s a 29-year-old science project and the only place in the state of Oregon where tea is being cultivated and sold. 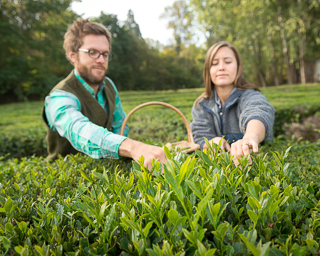 Minto Island Tea Company is equal parts business and passion for Elizabeth Miller and husband Chris Jenkins, who operate the tea farm as part of their larger Minto Island Growers, an organic vegetable farm. 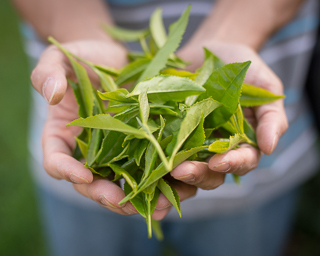 It’s less than a mile outside Salem, the state capital, and a world away from the epicenters of tea production. 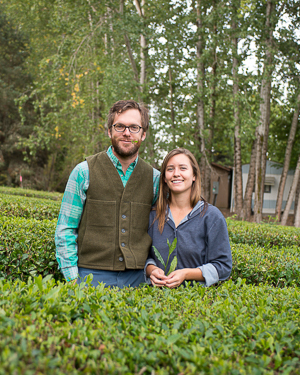 The project was started by Miller’s father, Rob Miller, and tea expert John Vendeland in 1988 to experiment and see how tea would perform in the Willamette Valley. Elizabeth was there to help on the farm as a child and always expected she would work the land. “John was really interested in the possibility of domestic tea production,” Elizabeth Miller said, recounting history. “He collected specimens from all over the world, different cultivars—over 200—to establish this test plot. This is a research plot, a genetic bank. 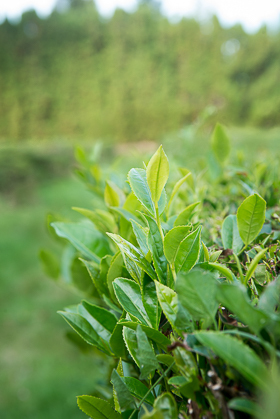 Currently, the yield is about 100 lb of tea each year, a blend of what is grown there. But the intention was never to create a production plot. Agriculture in Oregon’s Willamette Valley dates back as far as recorded human history. The rich soil was deposited more than 15,000 years ago when a miles-long ice dam gave way in what is now Montana and sent a cataclysmic tsunami of ice, mud, and rocks surging across the landscape, gouging out the Columbia River basin. Geologists estimate it all ended seven days later with flooding that extended as far south as what is now Eugene, Oregon, about 120 miles south of today’s Columbia River. The soil here is naturally acidic and drainage is very good, Miller said. While part of their farm acreage is more susceptible to occasional winter river flooding, the high water doesn’t stay for long. The city of Salem and the Minto Island Tea Growers’ plot are located right in the middle of the valley. Hops, filberts, mint, numerous varieties of wine grapes, blueberries, grass seed, and many other crops are grown across the valley and up its slopes. It was not unusual, then, for Rob Miller and John Vendeland to think this spot in the river’s floodplain held some potential for their tea laboratory. Their Minto Island Growers is a success in its own right, providing vegetables to local farmers markets, their own farm stand down the road from the tea plot, and U-pick opportunities for local residents. They participate in the Community Supported Agriculture (CSA) program. 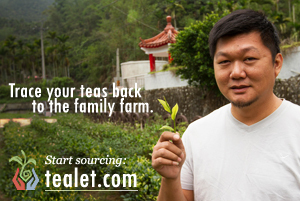 The tea farm, however, may soon be playing a larger role in the company’s efforts. That investment ramped up in 2016 when they planted an additional 10 acres on land they lease from Miller’s parents. However, a colder-than-normal winter wiped out most of that planting. So, in keeping with family tradition, the experimentation continues as surviving plants are nurtured and new ones go into the ground. In the end, they aim to establish 5 to 10 acres of specific cultivars. They intend to plant 4,585 shrubs per acre. Once the leaves are plucked, another experiment of sorts begins. “We are beginning tea processors. The art of tea processing is really complicated. The technical, the artistic, and the craft all come together and we’re just starting to learn about that,” she said. Interest in their product continues to grow. They sell what they produce on their website, at their farm stand, and at a Portland farmers market. They also sell plants. 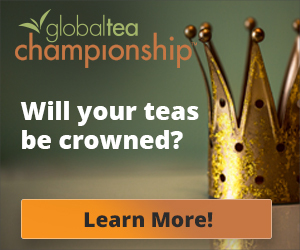 “We just get more and more people asking about the tea,” Miller said. “The attention we keep getting tells us we have a unique opportunity. We have to try to push the project forward. 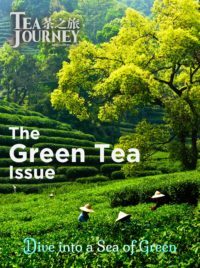 This article is a part of Tea Journey’s upcoming Tea Discovery issue, click to subscribe.